Leg ulcers are a chronic condition, the treatment of which has been estimated to cost the NHS between £300 and £600m per year. Leg ulcers usually have a number of causes, the majority (about 70%) being associated with venous disease. The prevalence of venous ulceration increases with age and the condition is also more common in women than men. A significant number of ulcers (about 20%), are caused by some form of arterial disease. Depending upon the location and severity of the problem, this may affect large parts of the leg or smaller localised areas of tissue. The prevalence of ischaemic or arterial ulcers also rises with increasing age. Other important causes of ulceration include diabetes and trauma to the skin around the lower leg especially in elderly people where the skin is extremely thin and heals very poorly. Ulcers that are caused by arterial disease or show no signs of healing despite adequate measures should be referred to a specialist vascular surgeon for assessment and possible surgery. What sort of ulcer have I got? It would not be a good idea for you to guess the type of ulcer you may have. Studies have shown that even doctors cannot tell the cause of an ulcer just by looking at it carefully. You should be referred to a vascular specialist to have a full assessment of your medical history followed by an examination of your ulcer and circulation. Your consultant may request some special tests to examine your circulation in more detail, most commonly an ultrasound test of your veins and arteries (duplex scan). If your ulcer is due to arterial disease, an angiogram may be necessary. Arteries are the pipes that take blood into your leg. This then has to be returned to the heart by the veins. There are 2 systems of veins in your leg. The veins you can see just under your skin are called the superficial veins. There is another set of deeper veins that are located within the muscle and adjacent to the bones of your leg. All these veins contain one-way valves so that the blood can only flow in one direction towards the heart-this is helped by the contraction of your calf muscles (called the calf muscle pump). The deep veins communicate with the superficial veins via a system of short bridging veins called perforating veins. Blockage or damage to the venous system will cause disruption to normal blood flow, which may manifest itself in a number of different ways. If the valves in the superficial system are affected, venous return will be impaired and blood may accumulate in the veins causing them to become distended and varicose. Following a deep vein thrombosis, the resulting damage to the deep veins may cause a complete or partial obstruction. Blood will begin to collect within the deep veins eventually being forced out into the superficial veins due to the unrelieved pressure produced by the calf muscle pump. The extra pressure in the superficial veins may cause them to become varicose and blood cells to leak out into the skin. 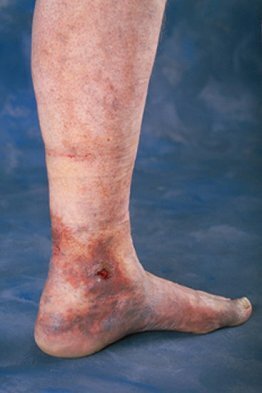 The red pigment (haemoglobin) contained within blood cells, causes a brownish staining of the skin around the ankle- an early indicator of possible ulcer formation. At this stage, any trauma from a small knock or scratch may result in skin breakdown and ulcer formation. If not dealt with quickly, this will progress with the end result of a large, malodorous and painful ulcer. Venous ulcers will not improve without treatment. They will only get worse. The mainstay of treatment is with external compression bandaging. This should not be started until the blood pressure in your leg has been measured to exclude an arterial cause for your ulcer. Your doctor or district nurse will advise you further. Many patients will improve with compression therapy although quite slowly. The disadvantages are that not everyone can tolerate the sustained pressure for long. Social appointments are constrained by waiting or travelling to see the nurse specialist. After some time, patients may become allergic to the bandages themselves. There is difficulty in walking and many people are embarrassed by the large and bulky bandages on public view. Sometimes it is possible to help venous ulcers to heal by having a varicose vein operation. This reduces the head of pressure on the skin around the ankle as described above. Unfortunately this doesn't apply to everyone. You will need to see a vascular surgeon to have an assessment. It is my practice to offer split skin grafting as a primary treatment for leg ulcers in young patients or those who have had many months or years of struggling with compression bandages and other treatments. Ulcers due to arterial blockages are caused by an inadequate blood supply to the foot. Characteristically, they are extremely painful typically at night time. Doctors refer to this symptom as 'rest pain'. The ulcer may be located over an area that is subject to everyday pressure such as an anklebone or heel. These ulcers are very resistant to dressings and may worsen with pressure bandages. Your doctor should refer you to see a vascular surgeon. A number of tests will be necessary including an angiogram. Treatment of arterial ulcers is with angioplasty (using keyhole techniques to stretch open the narrow area) or surgical bypass discussed here.